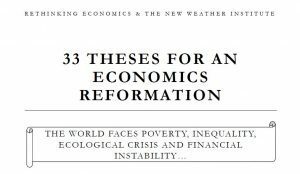 Marking the 500th anniversary of Martin Luther’s challenge to the established church, the New Weather Institute and campaign group Rethinking Economics, with input from a wide range of economists, academics and concerned citizens, challenged the mainstream teaching of economics and published a call for change in 33 Theses for an Economics Reformation. The call featured in The Guardian and was supported by over 60 leading academics and policy experts (see updated list below). Five hundred years ago in Europe, a single belief system dominated all public discourse: Catholic Christianity. Those held to be experts in this set of beliefs held immense power, since it enabled them to claim unique authority in all matters – from the rules of behaviour, to the right to rule. Kings and Queens listened to their advice, and feared their criticism. Intellectuals submitted to the confines of their ideology, as to break free from it took exceptional imagination and courage. Ordinary people may have had misgivings, but the priests protected their theories by speaking in a language that the public could not understand, concealing any contradictory evidence. There is now a similar situation in Neoclassical economics. It has developed as a belief system does, deriving all its theories from some founding principles which themselves pass unquestioned. It’s come to dominate public debate and decision-making; and its proponents claim special authority to pronounce on all matters – from money and savings to migration and sovereignty. Its teaching has taken on the characteristics of indoctrination: students are asked to memorise and repeat rather than to criticise and evaluate. Those who dispute its fundamental theories are ignored or marginalised. Its apparently sophisticated mathematical language presents to the public a veneer of expertise, while obscuring value judgements, guesswork and uncertainty which is, at times, as unworldly as any belief system based on faith. Five hundred years ago, Martin Luther broke the grip of the monopolistic belief system of his time, with ’95 theses’ setting out its faults clearly in the common language, making them plain for all to see, and proposing the beginnings of a new way forward. We propose a new 33 Theses for an Economics Reformation. The launch of the Theses was held at University College London and done in association with the Economists Society of University College London and the Institute for Innovation and Public Purpose. The whole debate can be viewed here: the Economics Reformation debate. Alan Cibils, Pofessor of Political Economy, Universidad Nacional de General Sarmiento, Argentina. Tony Greenham, Director of Economics, Royal Society of Arts, Manufactures and Commerce. I really enjoyed the discussion at the UCL event. I didn’t say anything, but I think two areas ought to be addressed. Firstly, the importance in modern capitalism of what Guy Standing discusses as ‘rent’ – the returns to monopoly, of which monopoly secured through state-defended intellectual property rights (copyright, patent, etc). Competitive markets in the sense that economists talk about them are an ideological construct, not a description of reality or an objective of policy. I note in passing that one of the other kind of rent-seeking monopoly, the state-awarded franchise, also requires the state to create and protect it. Second, the importance of the communication of economic ideas. Mariana Mazzucato (who was brilliant, BTW) alluded to this with her point about narrative and storytelling, but I think it was mainly lost. One of the ways in which what is often called ‘neo-liberalism’ has been so successful is that it’s really hard to think about other kinds of economic relationships, outside the framework of ‘market economics’. Pseudo-economic ideas about governments not being able to spend more than they ‘earn’, and about the private sector as the only place where value is created, become the commonsense of our age. Making other kinds of ideas into common sense is a key task for any economic reformation. It is deeply engrained within our culture that the government doesn’t have any ‘money of its own’ but only the money that it takes from us (we the people, who shalln’t be taxed without representation). But this is nonsense. In fact the government fulfils a valuable economic function for which fees are not only appropriate but actually essential (thus meaning that the government does indeed earn ‘money of its own’). Nor does the money paid as ‘income tax’ or ‘national insurance’ truly ‘come from us’ since 90% of income tax and national insurance receipts are collected via PAYE thus being unseen by the workforce and discounted by people taking decisions about work-choices. That’s to say people have rational expectations based on anticipated take-home pay when they decide whether to take a particular job or not. In fact one of the easiest ways to levy a tax that is proximately in proportion to the level of activity which an individual business represents is to require payment of a transaction tax on wages and salaries (i.e. employment). And this approach is appropriate because a business’s employment of workers is the best available indicator of the level of pressure on the country’s infrastructure resulting from the operation of that business. Essentially this tax levied on payments to employees is a surrogate charge for the use of the infrastructure as a business input. It stands in for an explicit rent, payable for using the infrastructure (both hard and soft infrastructure: roads, traffic regulation and policing; courts, contract law and its enforcement, as examples). This is what ‘income tax’ and ‘national insurance contributions’ represent in practice. How the government spends the proceeds from this taxation is a decision for us to review as electors (so having, theoretically, an equal or democratic say in how the money’s spent) – currently it’s predominantly spent as public alms (mainly pensions). Uncoupling employment taxes from the fiction of personal contributions by instigating an explicit Employment Transactions Tax could liberate public discussion of alternative schemes for the distribution of public alms and other elements of public spending. (And for more on this see: http://www.stparsons.co.uk/files/before_the_budget_november_2017.pdf). A new Economics can only be possible with a new social ontology (in contrast to the construct of the homo economicus), and a new epistemological foundation (methodological individualism), logical positivism. Economic alternatives need to be constructed on “other rationalities”. welcomed. This is time for a second Renaissance, seven hundred years ago we had a renaissance which liberated mankind from the orthodoxy of religion, today we need a renaissance to be liberated from the economic orthodoxy. What follows was posted on the Guardian web site under an article by Larry Elliot – referring to this article. It goes to the heart of the matter: how do govs’ raise money. No mention of the fact that governments (in control of their own currency) do not need to borrow (or tax) to spend – they can print & inflation will only happen if the economy is fuctioning at or close to 100% – this is a long way from the case in the UK at the moment. This is rarely discussed & is akin to “the existence of god – or not”. Many articles by Mr Elliot & others perpetuate the myth that Uk gov to raise money can only either tax or borrow. This is a fairy story – up there with the idea that one can sell indulgences to the gullible – who then think in buying they will avoid purgatory (the starting point for Luther’s theses)..
Printing money can also be blended with taxing (for distributional purposes) and borrowing (so that pension funds, amongst others, have something low risk to buy). The discussion needs to move to what should be the balance between these three money raising areas for gov’. (& note – govs need to spend first – before they can tax). There is insufficient attention to the rapid changes in human consciousness. Greed for money, power and possessions is diminishing. This may result in the socially retarded being the makers of markets. Is this an unstable system? A striking blind spot was no mention of land, and Thesis 15 omits to say how neo classical/neo liberal economics treats land, labour and capital as fictitious commodities. The authors use of the blanket term “Assets” is typical market fundamentalist speak. This is where political economy enters as these three factors can be treated as bundles of rights, and also with land and capital as socially created commons, beyond the market. Excellent Idea. Economics needs to be loosened up, rethought and re-imagined. Orthodoxy isn’t enough when the inequality is a great as it is and major challenges are ahead such as increasing automation and climate change. 2019 will be 10th anniversary of Elinor Ostrom’s ‘Nobel’ award for Economics, for her work on Management of the Commons and Eight Principles of Design. 2018 should be used to lead up to that celebration. Especially as next year will be 50th anniversary of Garrett Hardin’s ignorant essay ‘Tragedy of the Commons’, but which was leapt upon by those wanting to justify their zeal for enclosure, privatisation and rent. Recently I asked a new acquaintance what he did. “Been teaching politics for 30 years”, said he. “Oh, what’s your opinion of Elinor Ostrom’s work?” “Not heard of her. Tell me more.” “She won Nobel Economics in 2009”. “What for?” “Her life’s work on Management of the Commons and Principles of Institutions.” “Would that be the House of Commons?” “Errr, no! The Commons.” ….”Oh look at the time, I must away to the next session…” ended our discussion. Oh dear! There’s an enormous need for a better understanding of Commons. Far too many people jump, as soon as they hear ‘comm…’, to ‘communist’. Please help! Even lobby to be on Question Time, Any Questions, the Toady Programme etc. I’m fed up of hearing the likes of Lawson not being properly challenged. Neoliberal economic theory already encompasses all the issues brought up in the 33 thesis. Maybe some economist weren’t really paying attention in school. Or maybe they are just blinded by the desire to exert political power over society, thereby robbing people of their freedom so the economist can revel in their own smug elitism. Neoliberal economic theory simply recognizes that the DECISIONS about the allocation of scares resources with alternative uses SHOULD BE MADE BY THE PEOPLE WHO HAVE THE MOST TO GAIN OR LOOSE FROM THEIR DECISIONS. While not perfect, those who have the most to gain or loose from their decision will ON BALANCE make the right decision more often than third party decision makers who suffer no consequences when they make bad decisions. Therefore, a price driven economy will always respond more closely to the values held by the individuals within a society, than any other economic system. It was indeed a titanic achievement on the part of Luther and the Protestants to overcome the stranglehold of the Roman Church. The scale of that achievement is not widely appreciated, because it is not widely perceived that the stranglehold was all-encompassing, covering everything from the spiritual to the political and economic, through the military and monetary, down to what was social and cultural. The enormously difficult task was completed by Luther and the other Protestants because of several contributory factors. One of those was that the Reformers were clear not merely about what they were rejecting, but also about what they were asserting and therefore what space they wanted to create for liberty. Any rethinking of Neoclassical Economics will succeed only if the reformers are equally clear about what they reject, what they assert, and what space they wish to create. – the unwarranted trust in models and mathematical equations as anything more than useful prods to further thinking and analysis. – the discipline should seek to encourage stewardship of the natural, monetary, intellectual and cultural environments in the service of human flourishing. As for the third matter – what kind of space would be occupied by a Reformed Economics– it would explore, create and compare linguistic terms and markers, wider concepts and theories, and mathematical equations, algorithms and models, in order to establish and use those that best serve the above purposes. Presently, Rethinking Economics seems to involve a more or less amorphous gathering of individuals, with varying, divergent, and perhaps even contradictory orientations. That gathering needs to be transformed into a movement. In turn, such transformation requires clear enunciation of an overall framework (what is being rejected, what accepted, and what space is then created). It is only such a movement that can have at least some hope of eventually unmasking a discipline that pretends to be neutral but has played into the selfish interests of a small number of ultra-rich individuals. It is only the development of such a Reformed Economics that can have any chance of remaking the discipline of economics so that it retains its own validity as a discipline while also serving human and environmental welfare. Your comment ‘hits the nail on the head’ – without a consistent and ethical approach to merging the needs of the individual with that of all levels of groupings (including nature in its broadest sense), then this reformation ‘movement’ has no chance. I basically agree. I have just written an article on the same subject: economy is a subsystem of larger systems – ecology and society – so it can not be regulated and managed separately. Negative externalities of economic activities should not be paid for by the society. Consequently the GDP is a perfectly faulty indicator for measuring societal success. I want to continue my earlier comments. Unfortunately in Hungary it is impossible to teach anything else than “mainstream”. The entire economic policy follows the mainstream ideology. It is also impossible to publish any critical thoughts on the problems of the mainstream ideology. I tried, but the key Journals are absolutely against any critical thoughts on the mainstream approach. Finally – as I mentioned earlier – I managed to get my article accepted by the Journal of the Hungarian Academy of Sciences, entitled “Journal of the Hungarian Science”, but it has not been published yet.. I very much look forward to participating in the International Conference on Economics Reformation organized by the Hungarian Economic Association to be held on the 22nd of March. Economics seems to have lost some of the self-confidence of the days when it boasted of “fine-tuning,” had confidence in large theoretical systems like the General Theory, and persuaded the world it deserved a Nobel Prize. It may reflect a societal attitude that has lost interest and confidence in scientists of any sort. Economist gave up on fine tuning about the same society gave up traveling to the moon. Economists not only gave up on fine tuning but seem to have lost interest in developing large systems such as the General Theory. It may not be so much whether economists are doing relevant work as whether economic textbook authors have confidence in large theoretical systems that help them assign a place and value to the specialized studies. Perhaps interest groups have usurped the societal role of deciding truth in economic issues. Economic forecasting has been compared to weather forecasting. The same interest groups that want to decide truth in climate change issues also want to decide the truth in economic issues. With 24 hour news, economic scholarship may have lost influence relative to interest-group voices that have access to the media. In the last couple of weeks the Wall Street Journal carried a story about the end of the Phillips Curve in Japan. This one article may have more influence on popular economic thinking than an article written by a Nobel Prize winner in Economics. Universities may be part of the problem. By promoting publication for the sake of publication as long as originality is unquestioned, universities encourage researchers to look for less competitive fields where more low-hanging fruit is available, preferring the economics of drug dealers to the economics of inflation. Alternatively, it may be that the research potentialities of existing economic paradigms have been largely harvested. If the history of science is any guide new paradigms will come long which will inspire a whole new realm of original research.